No animal plays a more important role during the Great War than the horse. In a certain manner, the conflict would have been unthinkable without it. At this time, it is still "the noblest conquest of man". Without it, the armies could not manoeuvre, nor move their weapons, their munitions or their supplies. The time for doing everything by vehicle has not yet come. Horses by the millions are used by all armies, on all fronts, and die in the hundreds of thousands as a result of combat or exhaustion, illness, the cold or hunger. So close to the combatants themselves, in fiction about the Great War, the horse often becomes a more or less subtle means for touching on the experiences of soldiers. 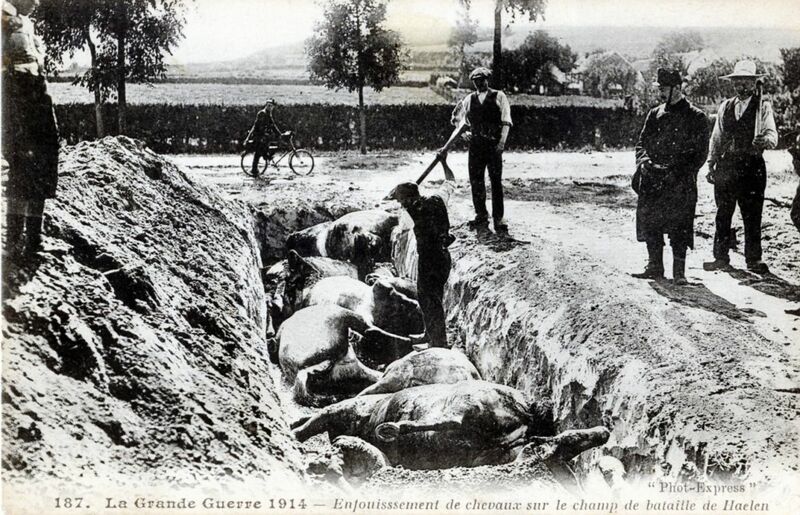 In the specific case of Belgium, horses did not simply experience the suffering at the front. There are many of them in the occupied territory and, like elsewhere, their presence and their work there are vitally important. Here is their story. No animal plays a more important role during the Great War than the horse. In Belgium, the 1914 war begins with two virtually simultaneous events: the Belgian army mobilises men and requisitions horses. What could the former have done at the front without the latter? The team of the combatant and horse will not split up before the demobilisation, in 1919. In the meantime, they will share all of the trials. In this beautiful summer of 1914, the very hot roads provide an immediate start to these trials. 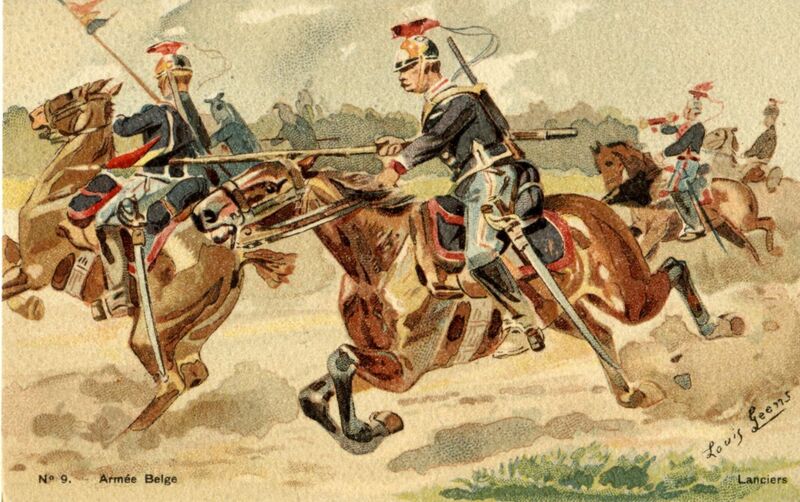 Like all armies then fighting on Belgian territory, the German army advances thanks to horses. This will still largely be true in 1940, even though the subsequent myth of the "blitzkrieg" have made us forget this fact. But in 1914, the importance of the horse is obvious. Cars and lorries only represent a useful but negligible fraction of the military transportation means. In Germany, like elsewhere, trains played the most important role during the mobilisation. But once in Belgian territory, sabotage, collapsed train tunnels and bridges, and deliberately derailed locomotives render the railway network unusable to the Germans before it can be repaired. 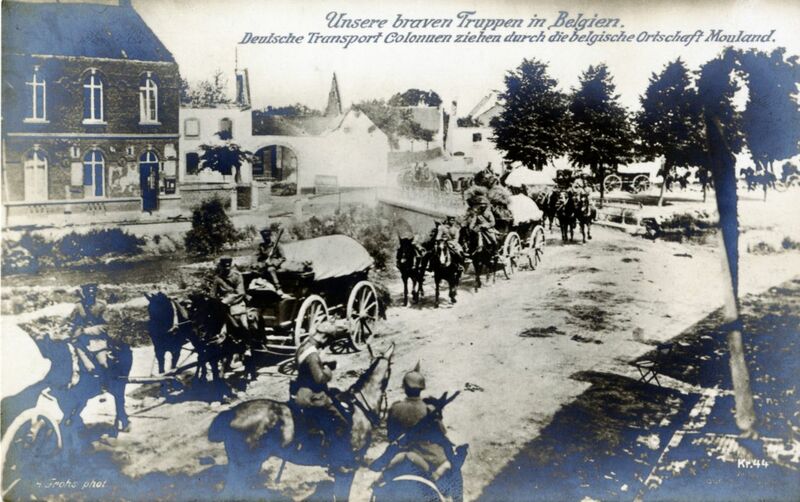 The men and horses of the five German armies that must cross Belgium spread out on the roads. In order to transport its supplies, just the 1st German army needs 84,000 horses, that consume nearly a 1000 tonnes of fodder each day. But even horses can wear out, horseshoes are not eternal, while illnesses and battle are already cutting into the number of mounts. Losses must be replaced immediately. Too bad for the Belgian civilians, farmers, breeders and simple individuals who will have to pay the price. Sometimes their animals purely and simply disappear, sometimes a vague requisition slip, fanciful or in good and due form, is placed into their trembling hands. In either case, the consequences for the people in question are the same. The victims sometimes turn to the communal authorities, in the hope of some hypothetical compensation after the war, just like this farmer from Mons in the chaussée du Roeulx : "on 23 [August] of this year, in the afternoon, German soldiers took a red mare from me, 30 months of age, value 1200 francs. Two others have been killed, 800 francs each, and two wounded, 750 francs each". Many of his fellow citizens will make similar statements, subsequent to the German losses in terms of horses during the battle of Mons. 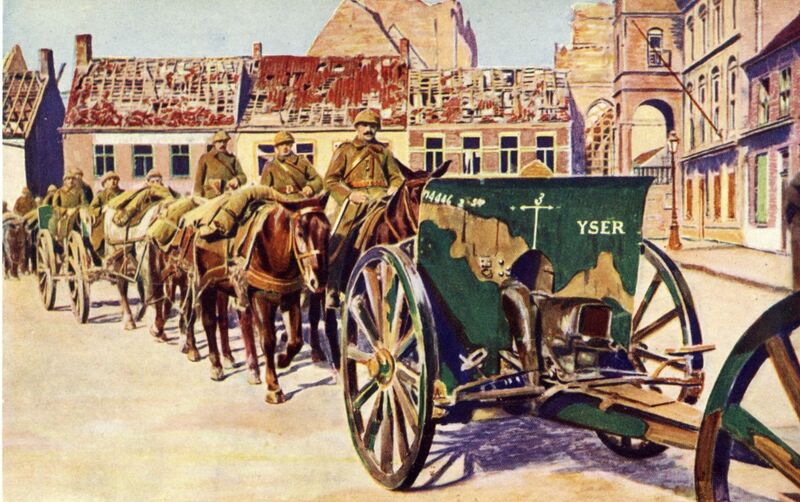 Facing the Germans, the Belgian army can itself only carry out its missions provided that horses play a leading role. For the cavalry, this is obvious. For the latter, however, no heroic but suicidal charges. 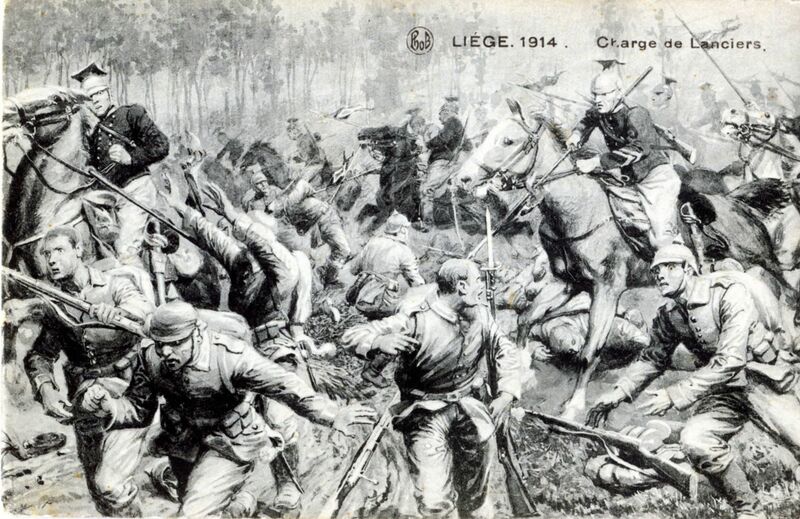 At the battle of Haelen, on 12 August, the Belgian Lancers dismount and it's on foot that they inflicte heavy losses upon the German cavalry, which underestimated them before being driven back. 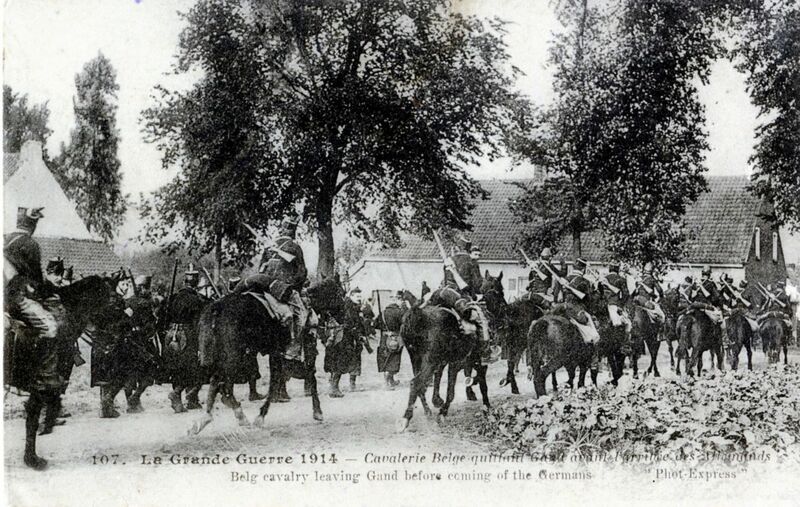 Throughout the rest of the 1914 campaign, the Belgian cavalry on horseback plays its role as a protective screen and information resource for the army. Thanks to the cavalry, bicycle units and a few rare armoured car squads, the Belgian commanders are relatively well-informed with regard to enemy movements, and quickly realise the extent of the forces deployed by the Germans in Belgium. None of the other branches can do without horses either. Every officer has one, allowing him to travel more rapidly through the infantry columns when necessary, to report to his superiors or to provide information to his subordinates. 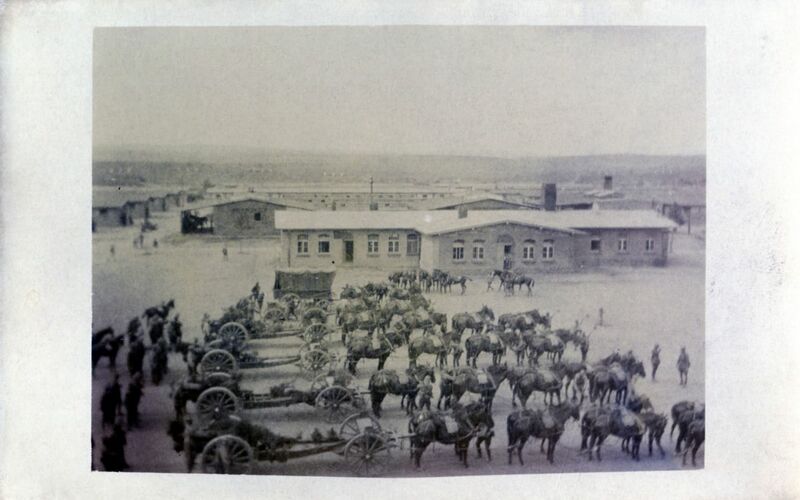 The equipment, supplies and munitions of the infantry and engineers are transported by carts, and of course, the artillery cannot move its men, cannons and ammunition without horse-drawn traction. Other than a few lorries, the ambulances of the health services are also pulled by horses, as are the travelling kitchens. 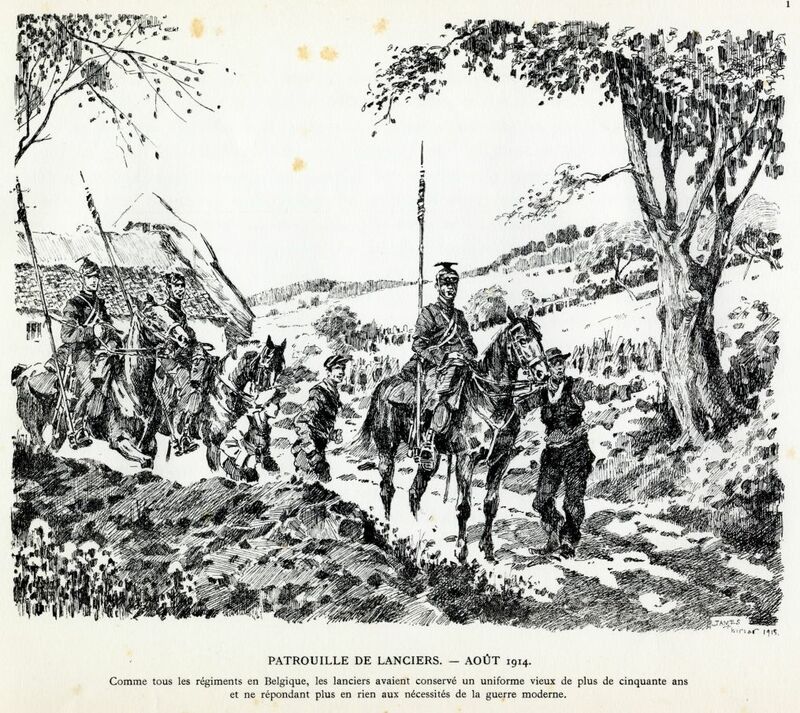 "Lancers on patrol – August 1914"
"Liège 1914. Charge of the Lancers"
From the opening days of the movement war, photographers take many photos of dead horses after the battle. Later on during the conflict, they will photograph human cadavers ad nauseam, preferably those of the enemy. But in these early weeks of the conflict, modesty causes the spectacle of death to focus on horses. There is nothing pleasing about the view of these remains. Photographs aren't taken, however, of the cows, pigs or sheep strewn about various prairies or stables, as the collateral victims of artillery fire. Horses are different. During the war, no animal dies as frequently alongside men, so much so that a horse's death becomes very human. The description of the bodies of horses, swollen, stiff, horrible, is one of the inescapable images in the diaries of soldiers, before becoming a common feature of war literature. The view of a rotting horse is heart-rending for a soldier, and a spectacle that portends his own death. 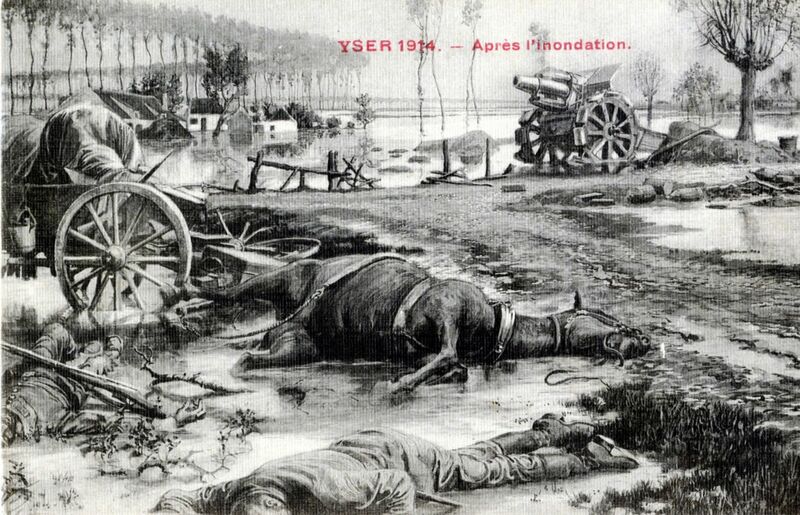 The cadavers of men and horses are never very far from one another, as described by sub-lieutenant Englebert Decrop, from the 10th regiment of the line, in his account of a patrol on the Yser at the start of November 1914 : " Everywhere we looked, we could only see huge puddles of water in which the cadavers of horned animals and horses were floating. It was sad, very sad. On the strip of land along which we were moving, a man's cadaver blocks our way. 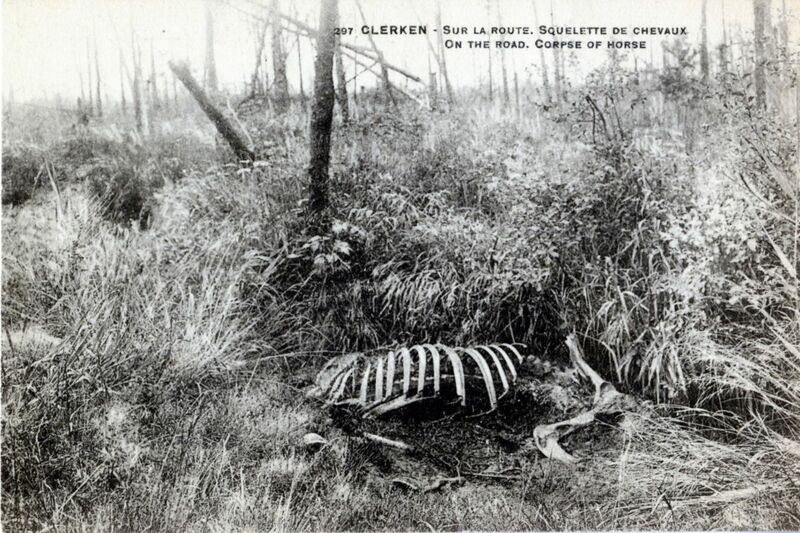 It's a soldier from the Belgian Chasseurs, resting there in eternal slumber. 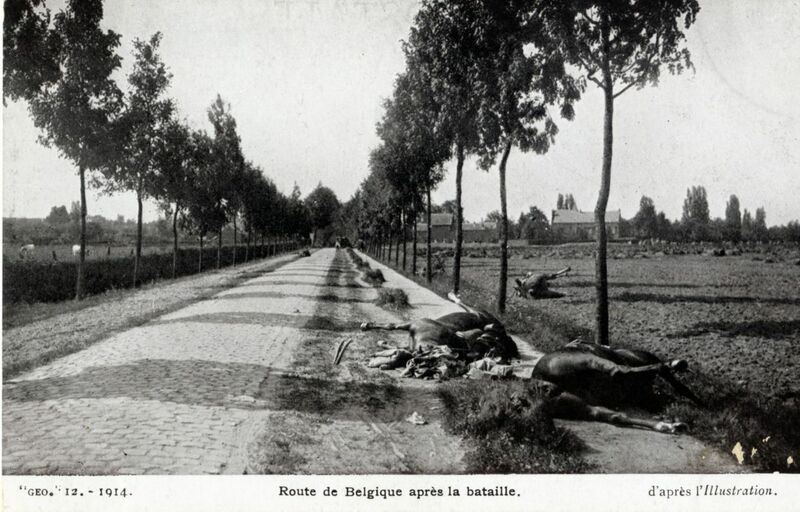 This was the first dead Belgian soldier that I had seen. We soon arrived at the village of Oudstuyvenskerke, where several German soldiers lay dead next to the demolished old tower. […] We encountered large numbers of dead animals: another Belgian cadaver from the line here, then another one, another from the line ". "Route de Belgique after the battle"
"The Great War 1914 – Burial of horses on the battlefield of Haelen"
"Yser 1914 – After the flooding"
"Clerken – On the road – Horse skeletons"
Everywhere we looked, we could only see huge puddles of water in which the cadavers of horned animals and horses were floating. It was sad, very sad. 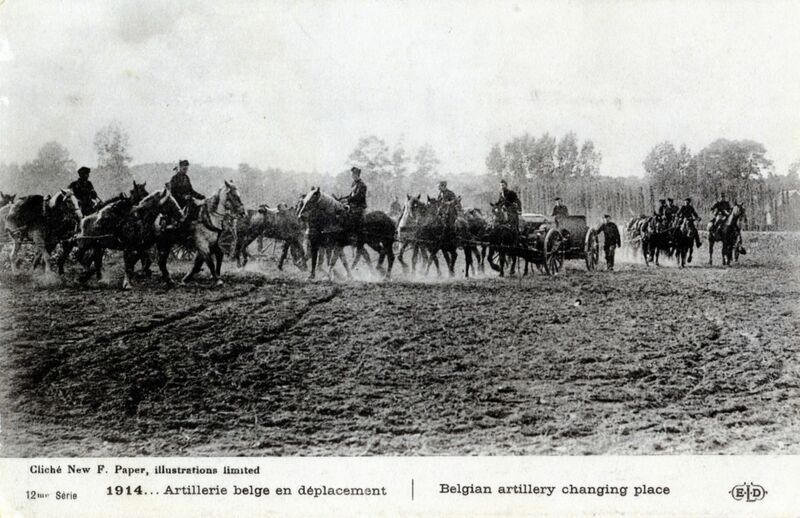 Once the Belgian army is in charge of a sector that is gradually stabilised, horses become essential. It's true that certain cavalrymen, refusing the lower status of having to fight on foot, preferred to exchange their mounts in favour of planes, taking to the air as part of the Belgian military aviation. It's also true that as one draws closer to the network of trenches, men must take over from horses and carry bags of sand, munitions, supplies or medications in their arms: it's a job for convicts. But behind the front, horses are everywhere. Automobiles cannot yet replace everything. The animals are as necessary as men, and victims of the same dangers. At the end of February 1915, Grenadier Gustave Groleau witnesses an aerial bombardment in La Panne: "Airplanes come and go; four Allied planes go by and five Germans, with the latter flying very high and dropping bombs. One of the bombs killed three horses and a corporal; the latter has his head bashed in". It isn't only shells and bombs that the horses have reason to fear. Starting in 1915, gases make their appearance. In case of emergency, the only solution is to move the threatened animals away as quickly as possible. At the end of August 1916, this same Gustave Groleau describes an alarm of this type: "There's gas. I quickly get up and wake up everyone who puts on their mask and get dressed. I also indicate the alarm to the musicians who are sleeping near us. In the street, everyone runs; We clear out the horses while the bugle is still playing.". Of course, the horses come along for the return to the movement war in September 1918. The cavalry will have no great role in the final weeks of the war, much to the dismay of certain units that absolutely want to illustrate themselves. The result will be the so-called "Burkel charge" of the 1st regiment of Guides, demystified in time by historian Francis Balace : an attack launched against good sense, on an unfavourable terrain. It will result in the deaths of seven men and 17 horses, victims of a ridiculous underestimation of the enemy strength and a misplaced desire for a grand gesture. The role of the artillery will be a much more important. On the devastated ground of the Flanders battlefields, lorries can't advance until the engineers have rebuilt some kind of roads. Nevertheless, the horse-drawn artillery must attempt to follow the infantry in order to provide it with the cover fire needed to continue its advance. The advance is slow across the Dantesque countryside left by four years of war and the incessant bombardments in recent days, before arriving at areas that are relatively undamaged. 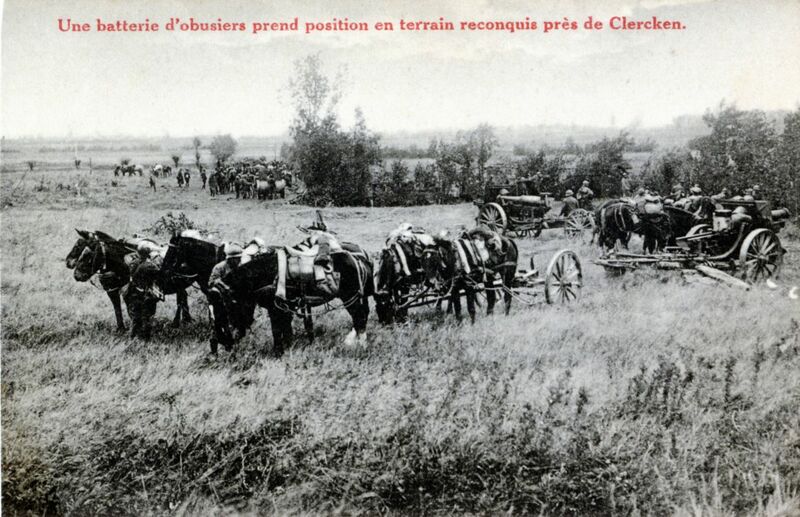 Many horses are needed for this task, both to pull the boxes of munitions and the artillery pieces themselves. Soldier Edouard Froidure, future priest and founder of the "Petits riens" charity, counts the personnel of his battery, the 101st of the 6th artillery regiment: "In all, we had forty-eight men and forty-eight horses for… four cannons! (not to mention all of the NCOs on horseback)". "1914… Belgian artillery on the move"
"Belgian army – Artillery convoy crossing a bombarded city"
After having brought the battery to its firing location, the drivers take care to move their teams a respectable distance away. Indeed, the horses are very vulnerable in case of bombardment. They offer a larger target for the shells than men, and unlike the latter, they are unable to take cover. In 1918, this same Edouard Froidure describes the effects of a single German shell on the horse teams: " six horses wounded and seven horses killed, and not one driver touched… ". Under these conditions, it's hardly surprising that at the end of the final offensive in the autumn, Froidure's battery has lost three quarters of its 48 horses. During the final offensive, the artillery men in this same battery have had almost nothing to eat for four days, when they come across the cadaver of a relatively fresh horse. Froidure describes what happens next: " We fell on it like vultures, slicing up the dead beast using our pocket knives! That day, we had a kind of American "steak", without salt or pepper, and not very tender ". Similar scenes occurred in 1914 during the battle of the Yser when, under similar conditions, small groups of combatants were no longer receiving supplies. Faced with debilitating hunger, the "noblest conquest of man" is no more than a chance for survival. 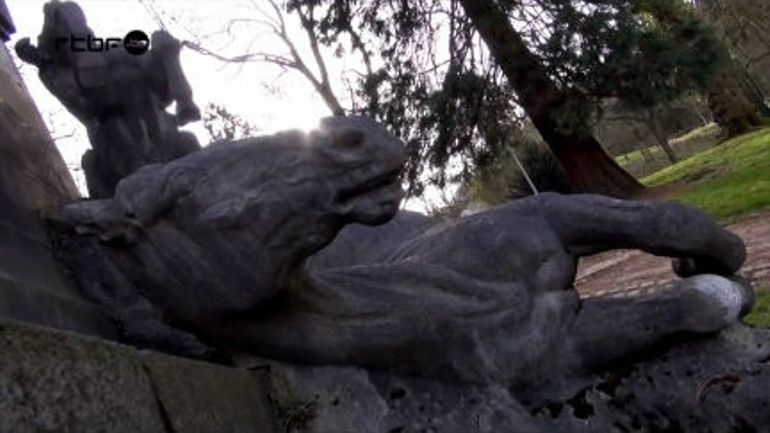 The remains of dead horses, on more than one occasion, were treated in the same manner by civilians in August 1914, during the invasion, while the communities were disorganised and supplies were uncertain. Once the occupation was in place, the surviving animals were more precious than ever. At the time, the Belgian economy couldn't operate without horses. In the transportation sector, they still pull a number of trams, carts in the cities and villages (now totally devoid of the few rare automobiles seen before the war), and even the stagecoaches that are put back into local service in order to overcome the fact that it is impossible for civilians to travel by train. They are indispensable for agriculture, both for ploughing and for the transportation of foodstuffs. No plant or manufacturing facility can operate without them, both for bringing in the raw materials and for carrying away the finished products. They pull the trucks at the bottom of the mines, bring the ore to the surface and to the loading docks, and pull the barges on the canals. Over and above the pre-war needs, horses are also indispensable for the CNSA (National Relief and Food Committee) in order to supply the distribution points with the foodstuffs needed for the survival of the population. 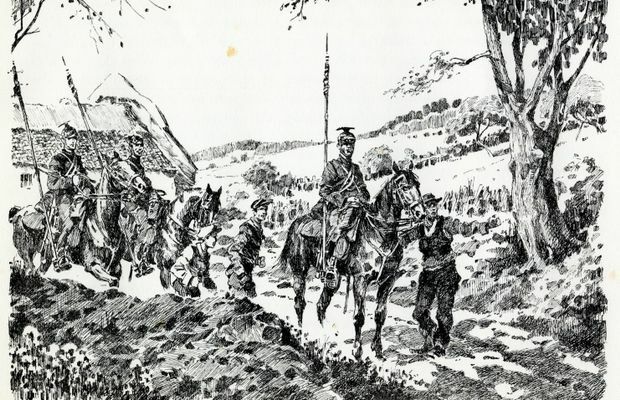 Nevertheless, the German authorities plan to use Belgian horses as they see fit, not only for the needs of the occupation army, which is their right according to the Hague Convention, but also for the front and for the purposes of the German economy, which they are legally prohibited from doing. So as to avoid violating international law too blatantly, the German authorities initially limit their requisitions, and set up purchasing centres through Belgian intermediaries. This perverse system was analysed by historian Jonas Campion. Belgian breeders were faced with an impossible choice: either they agree to sell their animals to "collaborators" before they came to be known this way, for a price much below their actual value, or the Germans would come themselves and seize the animals… in exchange for requisition slips. Blackmail was obviously efficient in most cases. This system also allowed everyone, with a bit of hypocrisy, to claim unawareness as to the final destination of the animals: only the final intermediary sold them directly to the Germans. Of course, this was an open secret. Breeders therefore had to make a choice between fraud, or pure and simple theft. To avoid this, some went so far as to personally sell their animals in Germany. A solution lacking in patriotism and even practicality, it was also only possible for breeders in the border provinces, Liège and Luxembourg. 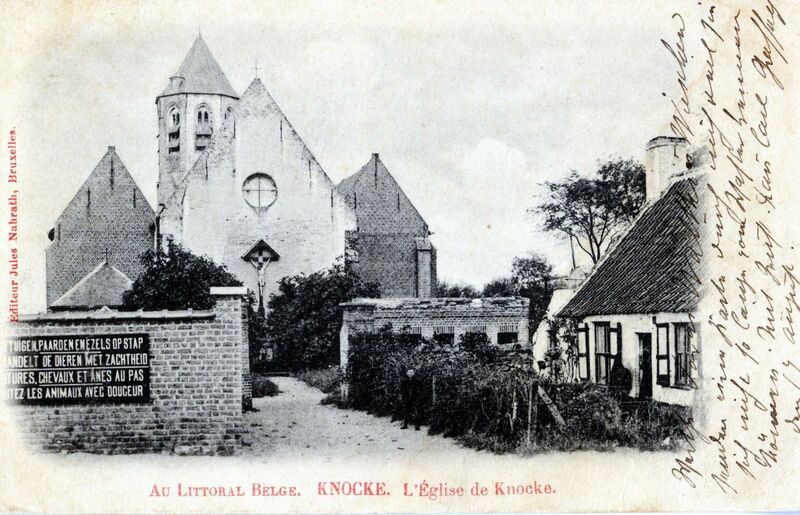 "On the Belgian coast - Knocke - the Church in Knocke"
In Brussels and its suburbs, it isn't unusual to see men harnessed to heavily laden horse carts. 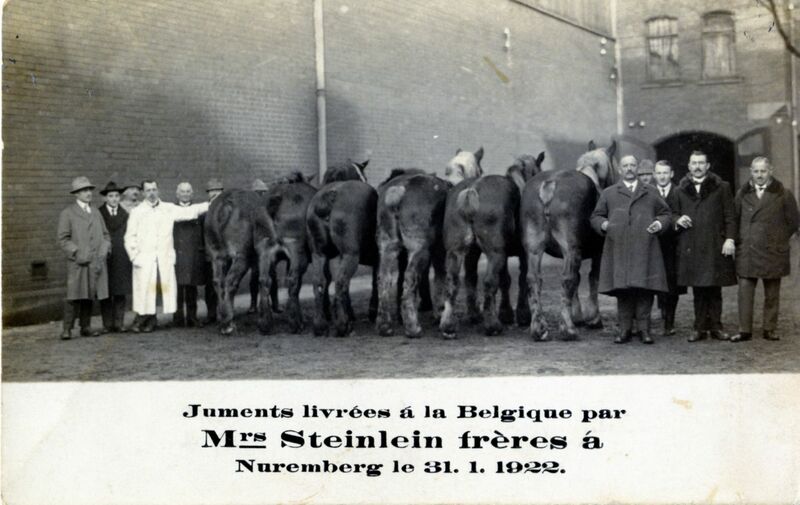 Despite the unquestionable success of such arrangements, the Germans take fewer and fewer precautions over time and increase the number of massive requisitions of horses, while being helped by their Belgian collaborators in the choice of the best animals. Many communities are affected, both rural and urban. Owners from several communities are obliged to bring their animals to a given location, which results in impressive gatherings, such as the one witnessed by Ephrem Danvoye in January 1917: " Requisition of horses at Seloignes for 11 communities. More than 1000 horses come to the village ". The Germans then choose the best animals, and set the prices themselves. 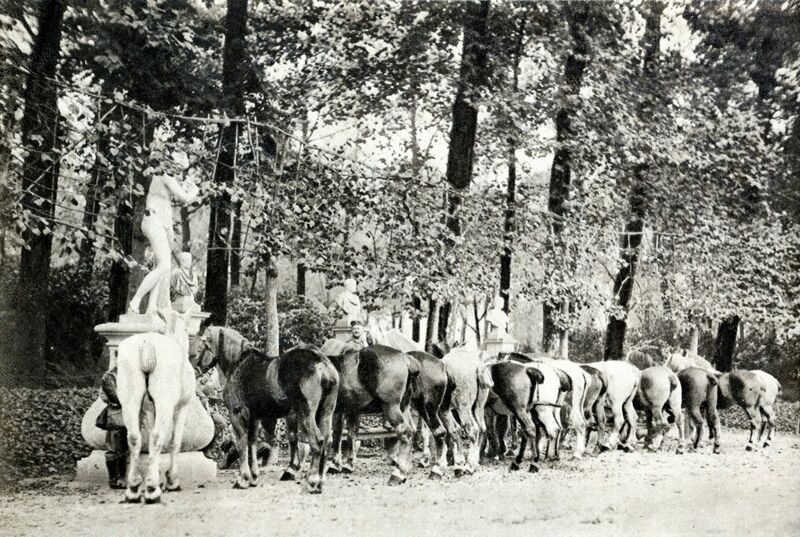 The example of Bertrix is indicative of the German desire to pay for the horses at a price much below their actual value, at the very time when all prices for basic foods are exploding: "In the spring of 1917, a remount – requisitioning of forces – is organised for all good fillies and geldings two years old or more. The animals are purchased for between 1600 and 2000 francs, while being worth 3500 and 4000 francs.". The proportions are the same elsewhere in Wallonia, such as in Ecaussines where, during a requisition on 14 November 1916, the occupants seize 76 horses while paying sometimes just under half of their value, sometimes two thirds. These measures strongly affect the men who work with horses every day, and upon whom their sustenance often depends. A horse isn't just a working tool, it's a precious asset as well as a companion in hard labour, which well deserves, when necessary, that one might take a few risks in order to save it, especially in view of the German requisitions. It is for that reason that, during the flooding caused by the torrential rains at the end of December 1966, two hauliers from Tubize drown: Emile Manderlier and Victor Rivière. Both of them, however, could have saved themselves. Manderlier, already tied to a safety line, chose to secure his horse as well: they are carried off together when the rope breaks. Rivière, for his part, drowned while attempting to cut the leather harness that was holding his horse to the cart, stuck in a drainage ditch. The two men died in order to save horses, that perhaps did not even belong to them: Rivière, for example, worked for a cooperative bakery. Their example indicates that the importance of a horse goes beyond any estimate of its market value. Over the course of the month, the results of the German pillaging are impressive. It is estimated, for example, that the occupier requisitioned no fewer than 10,000 draught horses. As part of the post-war reparations, horses will travel the opposite way in order to partly compensate for such damages. But in the meantime, the effects on agriculture, industry and transportation are foreseeable and unfortunate. In Huy, Jean Schaeger writes in January 1918 that "the horses have almost all been requisitioned. Most of the teams that you come across are made up of oxen and cows". In Brussels, L. Picon writes in July of that same year that "the searches [sic] for horses go on almost continually. In Brussels and its suburbs, it isn't unusual to see men harnessed to heavily laden horse carts. For servicing the roadways, this system had to be used, doubtlessly because oxen are so slow". And of course, the situation will not return to normal with the armistice. The same author notes no improvement until March 1919, with the progressive demobilisation of the Allied armies: "oxen are gradually disappearing. They're being replaced by horses and mules, sold by the English and French armies". "In Belgium, we have the bad habit of loading horses up to the extreme limits of their strength. All caring people ask: that horses, donkeys and mules should not be overloaded, that the drivers must realise that these animals were trained in English, and that they be spared the blinkers to which they are unaccustomed". In any event, the Australian soldiers take as many precautions as possible, requiring proof from the buyers that they have the means for the animal's upkeep, and obtaining a traceability right that allows them to come back and to subsequently ensure that the animal has been treated well. To this day, the English-speaking world devotes very special attention to animal suffering. It is certainly not by chance that, in 2004 in London, the "Animals in War Memorial" was created, devoted to the animal victims of the conflicts in the 20th century. Balace Francis, "La “charge de Burkel” ou la naissance d’un mythe" in Nefors Patrick and Tallier Pierre-Alain (dir. ), Quand les canons se taisent, Brussels, AGR, 2010, pp. 53-67. Brismé Claude, Les écaussinnes et les écaussinnois dans la Première Guerre mondiale 14-18, écaussinnes, éditions du C.I.H.L. écaussinnes, 1997. Campion Jonas, "La répression des trafics animaliers" in Rousseaux Xavier and van Ypersele Laurence (dir. ), La Patrie crie vengeance ! La Répression des "inciviques" belges au sortir de la guerre 1914-1918, Brussels, Le Cri, pp. 293-310. Depoortere Rolande, La question des réparations allemandes dans la politique étrangère de la Belgique après la Première Guerre mondiale (1919-1925), Brussels, Royal Academy of Belgium, 1997. Engelbeen Robert, "A Tubize. Les inondations du 30 décembre 1916" in Entre Senne et Soignes, Volume LIII, 1986, pp. 18-22. Hossey Guido, "Bertrix. Du village ardennais traditionnel à une bourgade régionale (1890-1918)" in Saint-Hubert d’Ardenne. Cahiers d’histoire, volume X, pp. 247-287. Lejeune Bernard, Les Australiens dans la région de Châtelet de novembre 1918 à mai 1919, Châtelet, Le vieux Châtelet, 2012. Strachan Hew, "Command, strategy, and tactics, 1914-18" in Horne John (ed. ), A Companion to World War I, Oxford, Blackwell Publishing LTD, 2012 (2010), pp. 35-48. Constant C., "Journal de guerre à Seloignes : 1914-1918" in Entre Fagne et Thierache, Volume 103, 1994, pp. 11-28. Decrop Englebert, Les carnets de guerre d’Englebert Decrop, edited by Louis Richardeau, 2012, online at the address http://www.sambreetmeuse.be/. Froidure Edouard, Coup d’œil sur le passé, Volume I, 1899-1921, un gamin en guerre, Brussels, Editions des Stations de plein air, 1968. Groleau Gustave, Au jour le jour avec un soldat de 14-18. Les carnets du grenadier Gustave Groleau, présentés par Jacques Liébin, La Louvière, Centre for Regional Research and Documentation, 2009. Schaeger Jean, La ville de Huy sous l'occupation allemande, 1914 à 1918, Huy, Degrace, 1922. General Archives of the Kingdom. I 507, dossier 9 (diary of L. Picon).